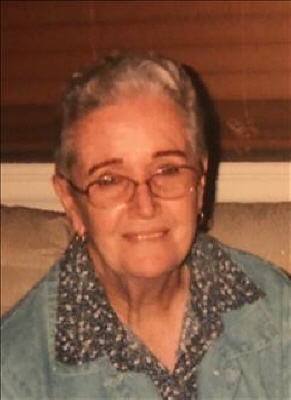 Edna Marie Scalf, age 88, passed away peacefully February 5th. Marie (Mema) was born on May 4, 1930 to Tom and Hattie Weaver in Russell, OK and later moved to Mangum where she lived most of her life. Marie also spent time in Altus and Colorado Springs. She loved working with people and spent most of her life serving others in the restaurant industry. As many of her friends knew, she loved collecting red birds and had hundreds of them around her house. Marie also enjoyed sewing, cooking, and baking the best caramel cake in town. She loved caring for her roses and visiting with friends and family. She attended Mangum Church of God until she was struck with Alzheimerâ€™s disease in 2006. Marie was preceded in death by her parents, her husband Bill Scalf, her only child Tommy Sheward, daughter-in-law Bonnie Struck Sheward, brothers Edgar Weaver and Paul Weaver and a grandson Jeromy Struck. She is survived by a sister, Ethlene Britton of Childress, TX and a brother Raymond Weaver of Columbus, GA, granddaughters Shannon (Matt) Sheward Newcomer of Colorado Springs, CO and Amanda (Mandy) Sheward Van Note (Chuck) of Golden, CO, Shannon Struck and Sunni Struck, both of Mangum, 17 great-grandchildren and numerous nieces and nephews. Marie was loved deeply by her family, extended family and friends in the community. Shannon and Mandy would like to thank the staff at Grace Living Center for taking such good care of their Mema over the past 12 years and especially to Terry Maddox for her gentle and nurturing care while Marie was in Hospice. Donations in her honor may be made in lieu of flowers to Grace Living Center in Mangum. To send flowers or a remembrance gift to the family of Edna Marie Scalf, please visit our Tribute Store. "Email Address" would like to share the life celebration of Edna Marie Scalf. Click on the "link" to go to share a favorite memory or leave a condolence message for the family.